WHAT ARE ANGELS in the BIBLE? Are angels real or invented? Why? What are angels in the Bible? 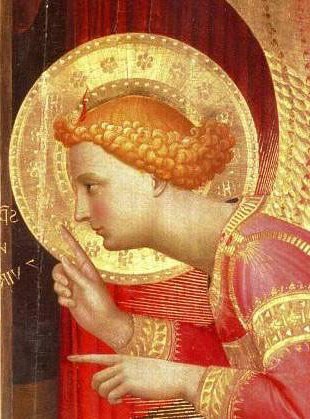 Angels in the Bible – what are they? So an angel is a spirit who carries a message, or performs a mission, for God. They are spiritual beings with a nature superior to human nature, but lower, much lower, than God. Where did the idea of ‘angels’ come from? In ancient mythology, the gods often lived in a remote and inaccessible place. So if mortals wanted to contact the gods to ask for protection or help, they had to use a messenger or go-between. Face-to-face contact with the Divine was too frightening. 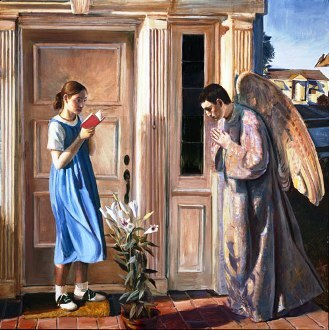 But an angel like Gabriel (see right) could be an intermediary, almost like a buffer, giving people confidence to speak to God or listen for God’s response to their prayers. People in the ancient world were not fools. 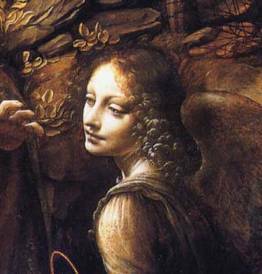 They did not make up the idea of an angel for the sake of a pretty picture or a reassuring story. What they were trying to do was express an idea by putting it into story form. This is very important, because if you don’t understand it, you won’t know what ‘angel‘ meant. People believed a loving God would want to communicate with them, or guide them towards a particular course of action. This communication was an ‘angel’. Today, if we were putting this into modern language, we would say that a person prayed and then felt a deep conviction that they should act in a particular way. This would be a real experience for them, a real message from God. This message was the ‘angel’. as being neither male nor female (they are spirits without bodies). 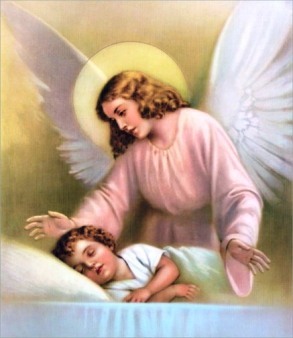 a spirit assigned to each person to look after and guide them – the Guardian Angel. Are all angels equal? No. 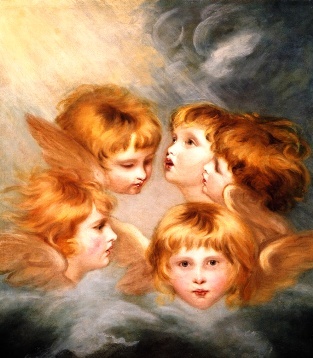 There are gradations or ranks among the angels – such as archangels, angels, cherubim and seraphim. There are also ‘fallen’ angels, who once disobeyed God – Lucifer is one of these. The Old Testament refers to supernatural beings such as Cherubim, Seraphim, the ‘heavenly host’, the ‘holy ones’, etc. For example, the cherubim are the keepers of Eden: ‘at the east of the Garden of Eden God place the cherubim, and a sword, flaming and turning to guard the way to the tree of life’ (Genesis 3:24). 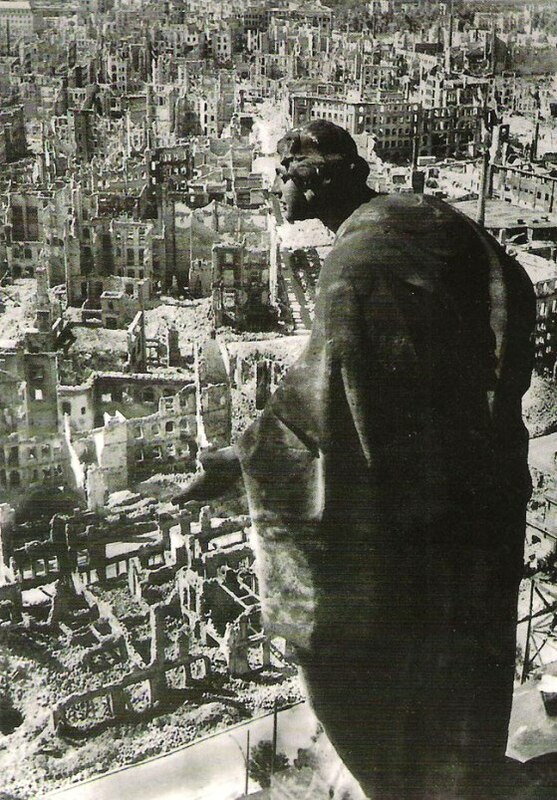 Or ‘… iniquity was found in you… and the guardian cherub drove you out from among the stones of fire.’ (Ezekiel 28:11-19). When people tried to visualize God, they sometimes saw him like an earthly king surrounded by his courtiers, except that God was surrounded by winged beings who served as a chariot on which God rode in glory. These beings followed and worshipped God, glorifying and exalting him – just as earthly courtiers did with an earthly king in the ancient world. But sometimes the elite angels acted independently, without carrying out the divine will – like Lucifer, who rebelled against the authority of God. In these cases the concept of a ‘bad’ angel was probably drawn from ancient pagan sources reflecting the struggle between Good and Evil. such as the moment when Abraham came close to sacrificing his son Isaac, or during the exodus from Egypt. In later tradition he was called Michael, a warrior angel who protected God’s people. 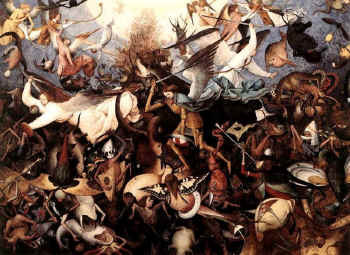 The painting at right shows the great battle for supremacy between Michael (good) and Lucifer (evil). As well, this ‘Angel of God’ carried out practical missions: preceding the Israelites in the Exodus, smiting Sennacherib’s army (2 Kings 19:35), guiding Jacob in his dream (Genesis 32). The Angel of God could not act independently of God, since authority and direction came only from God. 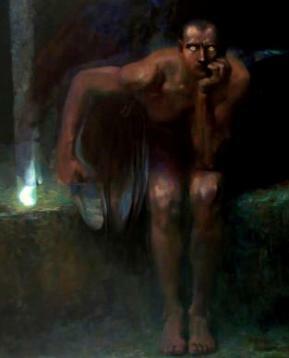 The ‘Angel of Death’ was a divine messenger who had the task of taking the soul from its body. It is described in the Apocalypse of John. In the Old Testament, this angel is one of the host of ‘destroying angels’. It is mentioned in several Psalms in a way that suggests that this particular angel may have been based on the Canaanite god Mot, god of death and the underworld. This angel was associated with Satan, prince of demons, the tempter – an angel who defied God by choosing evil rather than good. The biblical writers constantly emphasised that Good (God) rather than Evil (the Devil) would triumph. The Annunciation, John Collier. Mary as an American adolescent. 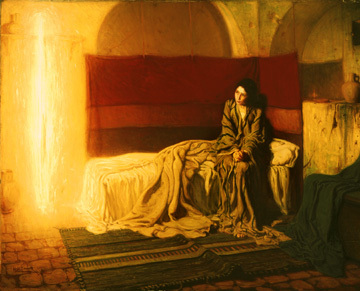 The sections of Matthew’s and Luke’s gospels describing the birth and infancy of Jesus stress the role of angels and visions as a means by which God made His will known to His servants – such as the angel Gabriel’s meeting with Mary at Nazareth. The Letter to the Hebrews (2:5-18) lays special emphasis on the fact that angels were created by God and that they were subordinate to Jesus Christ. The gospel of Matthew 18:10 suggests there was a special angel assigned to each person. In the passage just before the Parable of the Lost Sheep, Jesus says “Take care that you do not despise one of these little ones; for I tell you, in heaven their angels continually see the face of my Father in heaven.” The ‘little ones’ are not necessarily just children. They may be those who are weak in faith. This idea, of a spirit who can protect us and carry our prayers to God, has brought comfort to many people for hundreds of years. They sometimes appear in human form when they bring a message – as in the stories of Abraham, Hagar, Lot and Moses. They announce great events, as at the Annunciation or at the birth of Jesus or at the Resurrection. They have even been known to break people out of prison – see the story at Peter in prison. 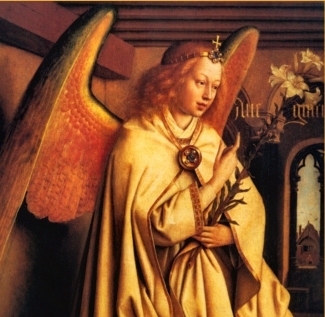 Some of the more important angels are given a name – such as Gabriel and Michael.